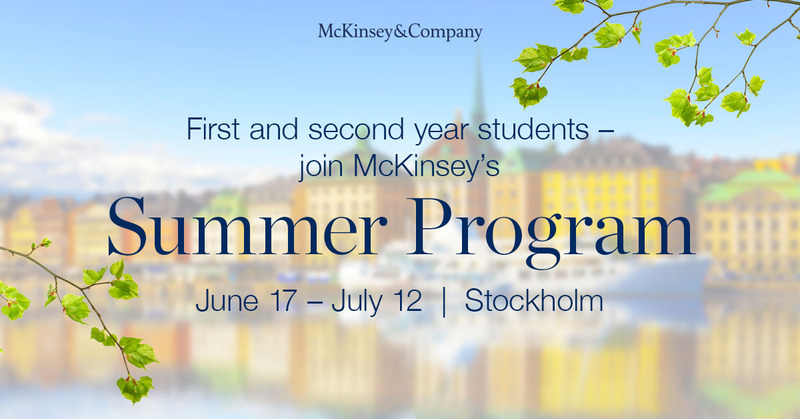 First and second year students – welcome to McKinsey’s Summer Program 2018! Experience the world of management consulting today! 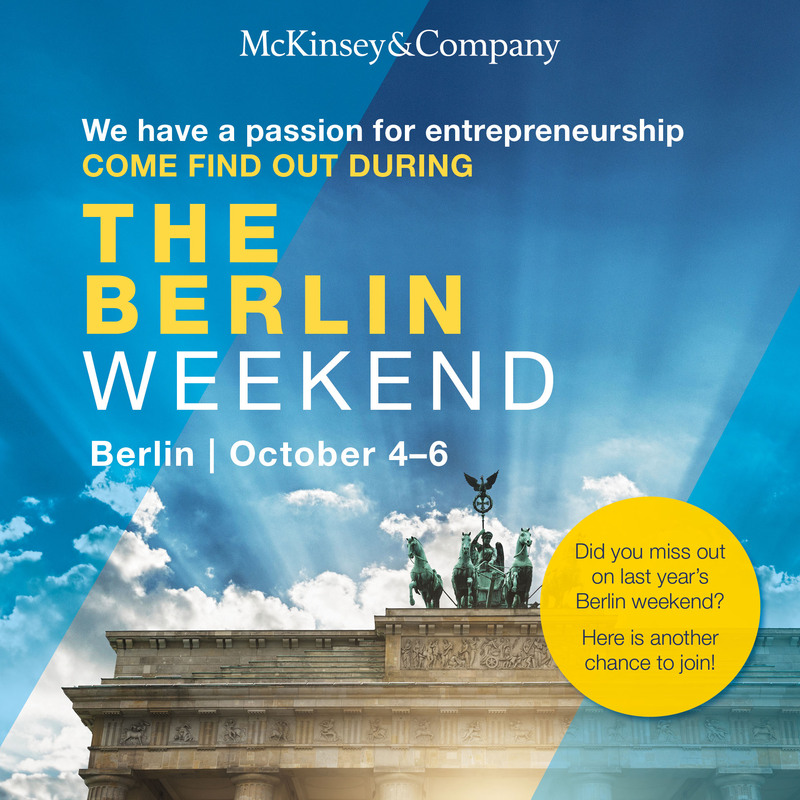 Be part of a four-week journey of problem solving trainings, personal development sessions, and hands-on team work with McKinsey colleagues. 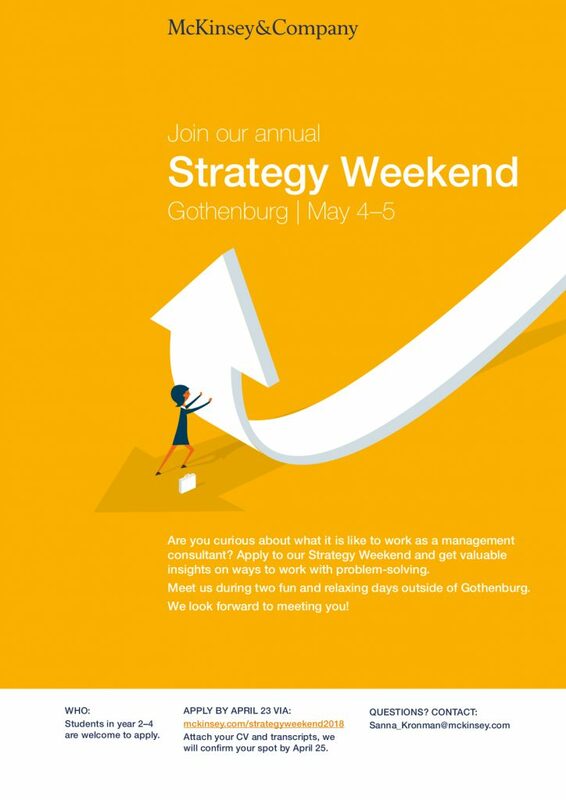 The program will take place June 18 – July 13 in Stockholm, apply and read more at www.mckinsey.com/se/careers/summer-program. Application deadline is April 5. 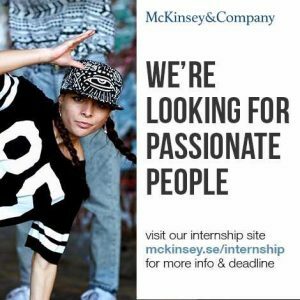 McKinsey & Company bjuder in er studenter till att söka till deras ledarskapsprogram som äger rum i Stockholm den 6-7 april. Ta gärna en titt vettja! 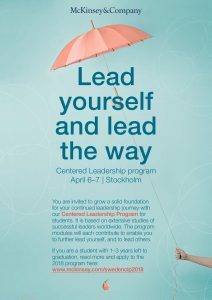 McKinsey & Company invites you students to apply for their leadership program which will take place in Stockholm during April 6-7. Take a look! You are invited to grow a solid foundation for your continued leadership journey with our Centered Leadership Program for students. It is based on extensive studies of successful leaders worldwide. The program modules will each contribute to enable you to further lead yourself, and to lead others. Welcome to join Mc Kinsey & Company Women in Business Feb 15-16 Learn, enjoy – get inspired! Join u s for two energizing days of learning and networking. Gain valuable insight on how to present with impact, and get to know other highly talented women. Enjoy some delicious food and fun activities in scenic surroundings north of Stockholm. Female students (from 3rd semester, all disciplines) are welcome to apply. 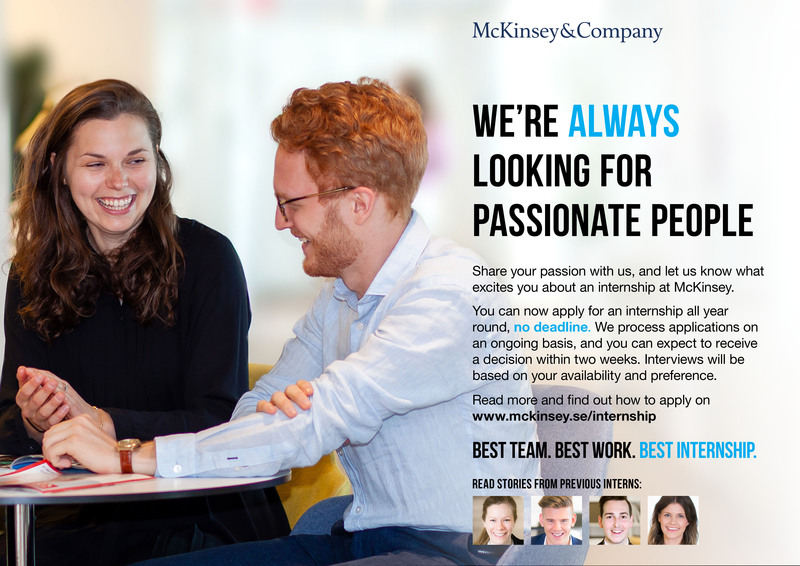 Send your CV to swedenwomeninbusiness@mckinsey.com. Application deadline is February 5, and we will confirm your spot by February 9. Whether you’re into breakdancing or birdwatching, we want to hear from you! Apply with your CV and grades, along with a cover letter and/or a 30-second video clip by October 9th.